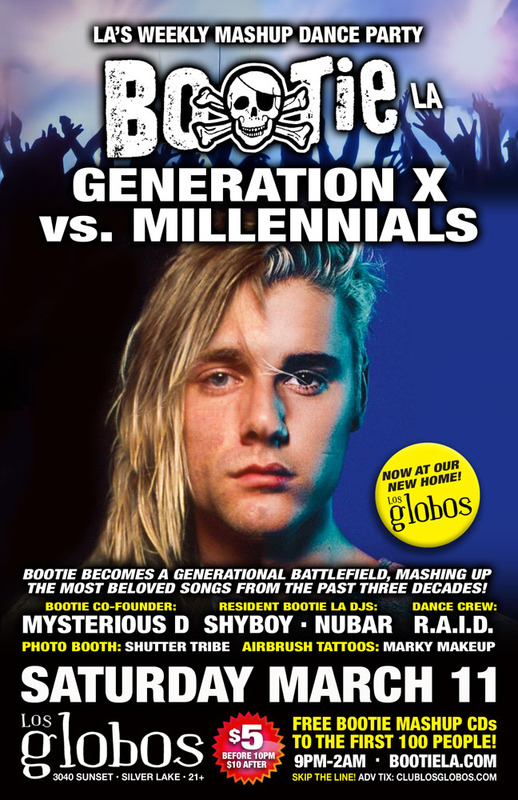 Bootie LA becomes a generational battlefield as resident DJs ShyBoy and Nubar mash up the most beloved songs from the past three decades! It’s Generation X vs. Millennials — where we take your favorite artists from the last three decades and mix and mash them with anybody and everybody, no era or genre is safe! Plus resident dance crew R.A.I.D. keeps the go-go boxes bouncing with their insane energy, while Marky Makeup gives you airbrush tattoos from your favorite decade, and Shutter Tribe will be there to capture it all! All this, plus free Bootie mashup CDs for the first 100 people through the door!